1867-1877. Idaho City, Snake River, and Placerville, Idaho Territory. An archive of six letters written by a settler in Idaho Territory during the Gold Rush. They were written by a Scottish immigrant named Margaret Kelley Stark (1832-1897), who had settled in Idaho Territory by way of Boston. She wrote to Matthew Brimmer Inches of Boston, for whom she had worked before moving to Idaho. The contents of her letters are primarily family matters. In the first letter, she reports her marriage to gold miner Thomas Kelley and the birth of their son, Melville. In 1869, she communicates her husband's death, and in 1872, she tells of her remarriage to successful cattle rancher William Kester Stark. She inquires about the Inches family in every letter and hopes to receive a reply. Stark would become one of the most prominent cattle ranchers in the Snake River area. Idaho Territory officially came into being in 1863, split off from Old Washington Territory, and Idaho became a state in 1890. The letters are as follows: a) ALS. 2pgs. December 18, 1867. Idaho. An autograph letter signed "Margt Kelley". Kelley tells of her marriage and newborn son: "I wrote you some months ago with the notice of my marriage perhaps you never received it. I can wate [sic] no longer for an answer. I am now a Mother which all...to be a fine bright boy...I have one of the best of husbands a fine baby good health many friends and am very happy...". The letter is in very good condition. b) ALS. 2pgs. October 5, 1868. Idaho City. An autograph letter signed "Kelley" and "M K". Kelley asks after the Inches family, who seems to have experienced recent hardship. She also speaks of her son's development and wanting to have his photograph taken: "my boy is walking healthy as can be never have been sick has 8 teeth and makes good use of them he was baptized 2 months ago his name is Melvill Inches and I trust god he will never dishonor that name how much I wish you could see him. I tried to have his likeness taken but we failed part on his account and part on the arts he could not attract his attention to look natural...". At the bottom, she writes "I send to each of the boys a specimen of the gold which is taken out of our Mountains". The letter is in very good condition. c) ALS. 2pgs. September 5, 1869. Idaho City. An autograph letter signed "Margt Kelley". Kelley reports the death of her husband, Thomas: "It is with a sad heart that I sit down this morning to inform you of the Death of my Dear Husband. I am almost broken harted [sic] was it not for my Dead little boy I feel there is nothing living for he was always so good and kind we were so very happy & I cannot yet...he is gone for ever...". The letter is in very good condition. d) ALS. 2pgs. September 4, 1872. Snack (Snake) River, Idaho Territory. An autograph letter signed "Margt Stark". After a long period of silence between Stark and Inches, Stark writes to tell him of her marriage and new address. "... I was married the first of May last. I have a good husband and kind father to my children. I have a home of plenty and Bright prospects...". She hopes that Inches will reply to her and include photographs of the children. The letter is in very good condition. e) ALS. 2pgs. January 14, 1875. Snake River. An autograph letter signed "Mrs M Stark". In this letter, Stark expresses her sadness over never receiving a reply to her last correspondence. The letter is in good condition; part of the back page has been removed, but it doesn't interfere with the writing at all. f) ALS. 2pgs. August 23, 1877. Placerville. An autograph letter signed "Margaret Stark". 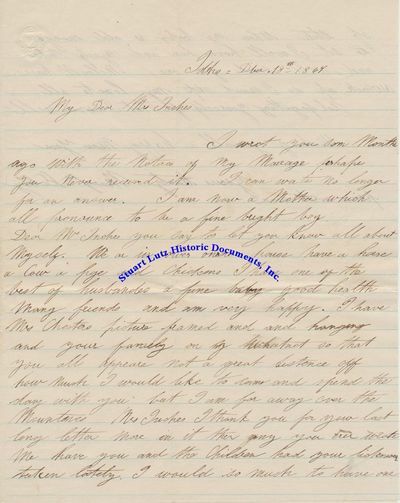 Once again, Stark asks for a reply from Inches: "I now sit down to break the long silence, I am confident you have written me although I have not received an answer to my last letter. Dear friend you seem so near to me I cannot give up corresponding with you and if it is not asking to much would say please write to me." She also speaks of her life: "...I have been living in town the past year putting the boys to school Mrs. Stark found a family for the ranch he is so anxious the boys may have schooling takes as much interest in them as their own father could I am for the summer months living in the country my niece teaches school in this district and lives with me...". The letter is in good condition with foxing.